We are an ornamental custom fabrication shop serving Northern Central Florida. We build custom projects using iron, aluminum, stainless steel, copper and brass. Our product line has grown to include beautiful railings and staircases, driveway gates and courtyard gates, fencing and furniture. We specialize in metal fabrication & aluminum fabrication. When a customer calls or stops in with an idea for a project, the first thing we do is sit down with them and talk about their needs, their schedule and their budget. 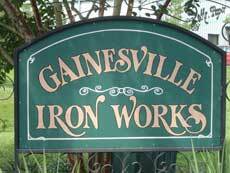 There is no job too small or too large for Gainesville Ironworks. Our commitment to customer service has built a company in which many builders and home owners continue to depend on. We are very proud of the craftsmanship and service that our company offers every customer. When our customer tells us that we have exceeded their expectations, then we know we have done our job.